A week-long campaign run by advertising agency Grabarz & Partner on behalf of UN World Food Programme (WFP) has enabled people in the city of Halle, Germany, to make charitable donations via NFC. With an NFC phone, users could tap on the food of their choice on the poster without the need to download a mobile application. Behind each food item on the poster was its own individual NFC tag, which made the chosen product appear on the user’s phone. 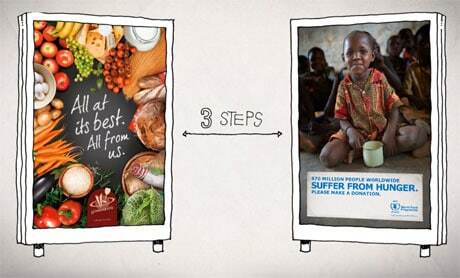 They were then required to walk across the bus shelter and tap their phone on the other poster to symbolically give the food to the child. After doing so, users were redirected to WFP’s website where they were asked to fill in a form with their payment details in order to donate the cost of their chosen food product. Grabarz & Partner told NFC World: “We just ran the one campaign as a prototype to check out how the technology works and to see if people want to use NFC. We wanted to see if it’s affordable to use it for campaigns in other locations.